An interesting feature of the city, and one that is a matter for congratulation, adding, as it does, to the historic interest of the town, and is a connecting link between the city of today and the early settlers who founded here the first village in New Jersey, is the fact that there are still in the limits of Jersey City quite a number of old houses built upon the Dutch plan, although there are but few dating beyond the present century. 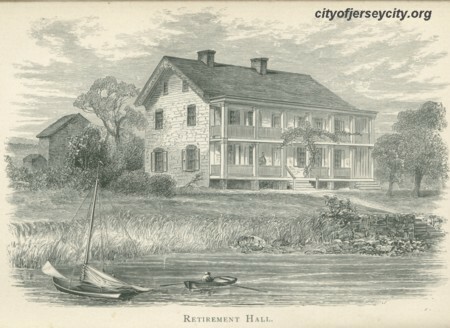 The Gautier house, on New York Bay, for some years the home of the Greenville Yacht Club, was built in 1760 by Captain Brown, and called "Retirement Hall." In the old days it was the scene of a lavish hospitality, and gay hunting parties were often gathered there. Captain Brown was the owner of slave ships, and the slaves were kept in the large cellar of his house, where the rings and staples to which they were chained were still in the walls, and, with the large fire-place, remained until a few years ago. The house became known as the Gautier house through the marriage of his daughter and heiress with Mr. Gautier. It has been held by several different owners, the latest of whom, the Lehigh Valley Railroad Company, are about to remove it. People who have resided there tell interesting stories of hearing the "swish" of oars and grating of boats upon the beach, followed by the tramp of feet from the shore to the cellar, and groans, with the rattling of chains. Originally the house had a double veranda across the front, and within ,the memory of the present generation it was still a beautiful place, with fruit trees and grape-vines planted by, the original owner, still in existence not many years ago. Mr. Brown was a devoted patriot, and served the country in many capacities. Then there is the old Midmar house, between Gates avenue and the Morris Canal, probably built by a Vreeland, some time in the last century. The Daniel Van Reypen house, at 320 Fairmount avenue, was also built before the Revolution; a story and a half Dutch house, originally with two wings. When the street was laid out one wing was cut off, leaving it with the gable end to the street ; otherwise the house has not been changed much, only as time has brought ruin, and dilapidation. The other old houses that are left date from the early part of the present century. The Van Reypen house, 201 Academy street, a little west of the site of the original house built in 1660-61, was built in 1802. 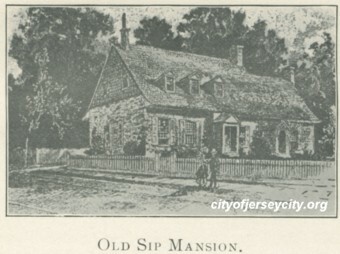 The Sip house on the corner of Bergen avenue and Newkirk street, which, like the Van Reypen house has sheltered four generations, is probably about the same age. The Van Horn house near Philip street, fronting the New York Bay, was built in 1804, on the site of an earlier house. It was here that Washington Irving wrote his "Knickerbocker History of New York," and it is to this house he refers in his sketch of "the House of the Four Chimneys." It has been remodelled, but the lower portion remains not greatly changed. 631 Bergen avenue was built in 1805, a square two-story brick and stone house, with an extension at one side. The old, tree which formerly stood in front of this house, about which were clustered many stories connected with Washington, was an English elm and probably set out about the time that the house was built. Then there are the Newkirk houses, built by the two families of that name. The one on Newkirk street and Tuers avenue, a little northeast of the site of the original house, was built in 1810. In the parlor is the high, carved wooden mantle, and the wide hall has the Dutch half doors, although the upper and lower portions are now nailed together. It is said that the father of the present owner, Mr. Gerritt Newkirk, who died in 1893, shot in Greenville, in 1873, the last wild deer seen in Hudson County. The house 52 Sip avenue was built by Mr. John Newkirk, on part of the Newkirk farm. The stone house at 36 Church street was built in 1829, by a member of this family, Mr. Henry Newkirk. The other Newkirk family built the old house on the east side of Bergen avenue, between Magnolia avenue and the bridge, also the house on the southwest corner of Bergen and Jewett avenues, which has been remodelled and is now one of the prettiest houses in Bergen. Another very interesting old house which has been remodelled is the Halmagh Van Houten house, west of the reservoir, on Summit avenue near Germania street. On the southeast corner of Bergen Square stands the DeMott house, still in most excellent condition. The old house on the southwest corner of Glenwood and Bergen avenues, was built about seventy-five years ago by Mr. George Tise, upon the site of the old Stuyvesant tavern, largely of the material of the former building; in the rear wall is the date stone of the old house, marked "P. S. 1762." This house was a tavern within the memory of comparatively young people and was quite celebrated for the good dinners and suppers served there. Fricasseed snapping turtle and roast pig were among the choice dishes. The barns and sheds were on what is now the opposite corner of Glenwood avenue, and here, the people who came froma distance, put up their teams during the Sunday services. At the Five Corners are several interesting old houses; Riker's Tavern on the southwest corner of Newark and Summit avenues, and Coulter's general store, now a grocery store and dwelling house, on the southeast corner of Newark and Summit avenues. 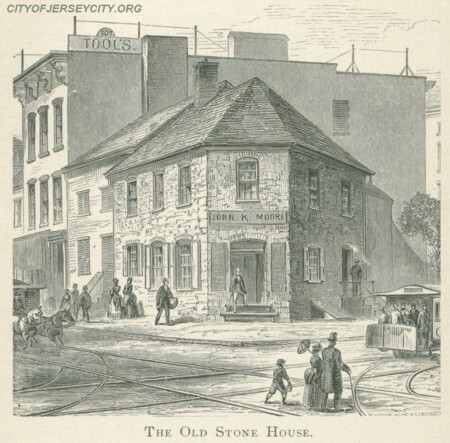 Coulter's Tavern was on the site now occupied by the Avenue House; the old stone house built for a tavern by Mr. John Tise, on the northwest corner of Newark and Summit avenues, and the old building, formerly a store kept by Nicholas and Justus Jerolaman, on the northeast corner of Summit and Hoboken avenues. It is said that at the Corners, just in front of the point where stands the Avenue House, there was formerly a Liberty pole, probably erected about 1812-14, but at a St. Patrick's celebration, not long before the Civil War, there was found in the early morning a St. Patrick hung in effigy upon it; the indignant Irishmen cut the pole down and it was never replaced. Many of these old houses are a story and a half, some fronting the street, others with the gable end to the street, with dormer windows in the sloping roof which extended out over the porch, sometimes upon both sides of the house; in others the porch was only in front, and in the rear the roof sloped to within a few feet of the ground. One peculiarity in many of these early houses is that instead of using lathes, the "brown coat " of plaster was mixed with straw and thickly plastered on to the stone. Almost invariably an extension was built at one end, with the roof a few feet lower than the main part. In later days this was the kitchen, but in olden times the kitchen was a detached building, and the slaves slept in the loft. In the main part there was a wide hall, usually through the center of the house, but sometimes at one end, with the Dutch half doors at either end. During the summer months the family meals were usually served in the hall; they used a "comfore," a sort of chaffing dish with hot coals, upon which the kettle was set to boil the water for the tea. During the winter the living room was also the dining room. There are still preserved in some of these old houses, choice heirlooms of quaint furniture, rare old Delft, Prints, Psalm books with great silver clasps, a few old Dutch Bibles with board covers, and interesting relics of many kinds, of which an occasional glimpse is given at some loan exhibition, but usually they are carefully guarded from profane eyes. In 1806 the United States Government became possessed of the property on Palisade avenue between Hoboken and Newark avenues. Here was situated the old building known as the Arsenal, which served as arsenal, barracks, and hospital during the war of 1812-14, and once again as barracks in the war of 186165, the Anderson Zouaves and the New York troops being quartered there. Several of the soldiers who died there in 1812-14, are buried in the west corner of the cemetery on the southwest corner of Vroom street and Bergen avenue. After 1865 the old Arsenal wasused as a tenement house until it was torn down, about twenty years ago. Although all trace of it is now lost,the, memory of it should be preserved. Two very interesting houses in lower Jersey Cityare on Wayne street, of Ionic architecture, built about seventy years ago -- one, No. 95, by Cornelius VanVorst, and the other by Dr. Barrowe -- and so carefully and well built that to this day they have needed no repairs. The houses are forty-seven feet front by fifty five feet deep. The columns in front are twenty-eight feet high. The doors are of solid mahogany, and it is said that the original window glass was tinted and imported from Venice. The veined marble mantels were also imported In the wide central hall was a great stove, with pipe running up through the hall above. This, with the grates in each room, was the only means of heating the house. When built the houses were the only ones on the block, but that was too limited a space for houses as large as those. Another very interesting old place was the Tonnele homestead, built in 1837-8. In 1835 Mr. Tonnele bought the old Dr. Hornblower place, on the west side of Summit avenue, a ten-acre plot, extending from a little south of what is now Magnolia avenue to the center of what is now Pavonia avenue, where it joined a Van Reypen farm. Dr. Hornblower served in the Revolution, having joined the army from Belleville. 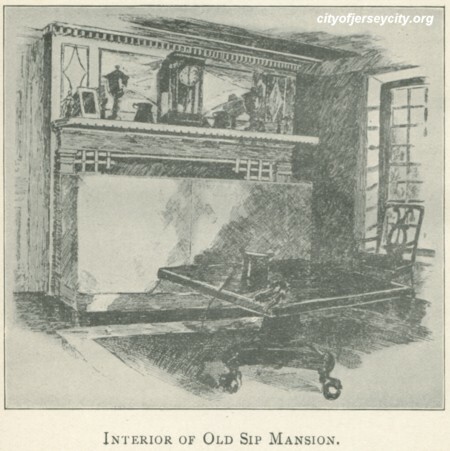 After the war he studied medicine, and came to this locality in 1789, and began the practice of medicine -- the first doctor known to have practiced in Jersey City. He married, and built a house about the center of the block between Pavonia and Magnolia avenues. The date of building is not known, but probably it was about the beginning of the century. The house had a wing on either side -- one used as an office, and the other as a kitchen. After Mr. Tonnele bought the property he removed the main part of the house to its present location on the southwest corner of Magnolia and Summit avenues, leaving the wings for a lodge and gardener's cottage. Along Summit avenue he built a high stone wall with iron gates, about where the old house had been. Inside the wall was a hawthorn hedge and a row of mulberry trees. A driveway, bordered with cherry trees, extended from the gate and around a circular lawn in front of the house, which stood on the west side of the grounds. It was built of trap rock, some forty feet square, three stories and basement, with a wide ve randa in front. A wide central hall with large rooms on either side. The ceilings were beautifully frescoed, the mantels were of Sienna marble, and the doors of solid mahogany. It also was heated from a great stove in the hall and grates in the rooms. It is said that John Kelly, the Tammany Sachem of New York, put the grates in the house. The grounds were beautifully laid out, and many of the fruit trees were imported from France. The furniture for the house was made by a Frenchman in New York. Mr. Tonnele was born in New York City; his mother a daughter of General Waterbury, of Connecticut, and his father a Frenchman, who came to this country about the time of the Revolution. He founded a chamois glove factory in Water street. It is said that he never spoke a word of English, nor did his wife ever speak a word of French. Mr. Tonnele, of Jersey City, was the first Catholic member of the New Jersey Legislature, and served in county offices. He laid the corner stone of the Court House. The old stone house has passed through numerous changes in its com paratively short life. From the hospitable home of the Tonneles it became the first home of Christ Hospital, later a tenement house. The grounds have been sold off in city lots, and the old walls are a dilapidated ruin.